Since his death in New York in 1990, the American audience for the exiled Russian dissident writer Sergei Dovlatov has dissipated. But efforts are underway by wealthy friends and fans to convert one of his last homes in Russia – a simple log cabin on Pushkin’s estate where he lived in some despair – into a museum. At the same time, his devotees hope to revive interest in his work, especially his fiction, which 25 years ago graced the pages of The New Yorker. Dovlatov would be only 70 on September 3 if he was still alive, but no lavish celebrations are expected. Before he left the Soviet Union in 1979, Dovlatov worked as a tour guide at the family estate of Alexander Pushkin, the 19th century Russian poet who is considered the font of all modern Russian literature. Dovlatov rented a room in a log cabin on the Mikhaylovskoye preserve, which is located about 70 miles south of Pskov, but this was no voluntary immersion in Pushkin’s world. At the time, Dovlatov was deeply frustrated by his inability to get his work published, was living in poverty, and was tormented by debt. His reminiscences formed the basis of the story “Zapovednik” (“The Preserve”), acclaimed by critics as one of his best works. Much has changed since Dovlatov lived on the estate. Gone are the “squadrons of tourists” who got on Dovlatov’s nerves. They vanished together with the Soviet Union, says Svetlana Kovshirko, a local woman and manager of the literary hotel Arina R.
Almost all the houses in the area have been bought by strangers and renovated. 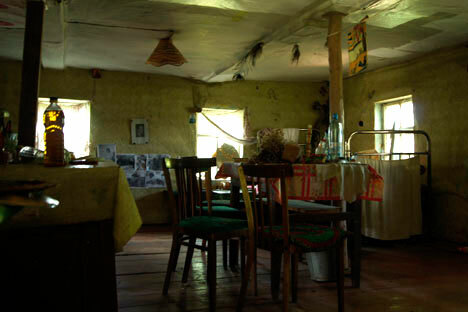 The log hut in which Dovlatov lived is one of the few exceptions. It survived in its most basic shape because its owners were too poor to repair the cabin. It was owned by a wood-cutter called Ivan Fyodorovich and his wife Yelizaveta. Dovlatov rented a room from them when he came to the village, and he immortalized Ivan Fyodorovich in “The Preserve” through the character of Mikhail Ivanich. The house is associated not only with his fiction, but with his thoughts about emigration. A year after arriving at Mikhayalovskoye, Dovlatov followed his wife to the United States where, at last, he earned a living from his literary work. Through the 1980s he published a succession of books – sad, ironic and imbued with compassion for his fellow human beings – and his stories were published in The New Yorker magazine. Dovlatov was lauded by the Nobel Prize winning Russian poet Joseph Brodsky who valued “the muted music of common sense” in his work. Dovlatov later enjoyed a burst of popularity in his native land and the expression “Dovlatov story” would come to denote a paradoxical event that defies stereotypes. Dovlatov’s writing would only reach Russian readers in the 1990s, after his death. But the sense of freedom in his fiction resonated with the times. Now a group of businessmen want to rekindle some of that interest by renovating the house at Mikhaylovskoye where Dovlatov rented a room and turn it into a museum. Dovlatov once wrote of the house that “stray dogs got in through holes in the floor.” And he wasn’t exaggerating. In the 1990s Ivan Fyodorovich died from alcoholism and his wife Yelizaveta sold the house to Vera Khalizeva, a retired woman from Moscow. She patched up the holes in the floor with plywood but otherwise little changed. The wooden house was crumbling when it was bought about 12 months ago by a group of Dovlatov fans who prefer to remain anonymous. The house remains in a decrepit state. The floor sags underfoot and the ceiling is more or less supported by poles. Some of the items used by the writer remain: an iron bed, a wooden stool, and a fragment of a mirror. The walls are covered with wallpaper from the 1970s. An old newspaper clipping about popular Soviet actress Faina Ranevskaya titled “The Doomed Star” is tacked to the wall. Repair work has just begun. “Our task is to preserve everything while replacing the rotten parts,” said one worker on the project. Gavryushkin said he hopes to have the house at least partly repaired by Sept. 3 to mark Dovlatov’s birth 70 years ago in Ufa, Russia. In September, an exhibition by the local artist Igor Shaimardanov, which is devoted to Pushkin and Dovlatov, is scheduled to open. Dovlatov had no interest in official celebrations or memorials. “It is always like this: First, they do a person in and then start looking for his personal belongings,” he wrote about Pushkin. Something similar is happening to Dovlatov today. The new owners of the house are hoping to obtain personal belongings from the writer’s friends and relatives. The Pushkin museum-preserve is planning to develop a guided tour based on his work. The locals, happy for any kind of development, support the idea of turning the house into a museum. And many of them recall the writer even though they were children when he lived here. “He was a scallywag,” said Kovshirko, the local hotelier. Galina Simakina, who worked with Dovlatov, said he had a large personality: ”While he worked here he behaved like Pushkin: trying to look at the world through the eyes of a talented poet.